Atlanta, GA – February 7, 2019 – In just ONE more day the United Sprint Car Series Outlaw Thunder Tour presented by K&N Filters winged sprint cars restart their 23rd season at Bubba Raceway Park in Ocala, Florida on Friday and Saturday, February 8th and 9th with Rounds #3 and #4 of the 2019 USCS “Winter Heat” presented by FireAde ten-race mini-series. $5000 is up for grabs over the weekend for a driver who can clean house by winning the main event each night. The first night’s main event on Friday night will pay $2000 to the winner with $2500 to the driver who parks it in the www.rockauto.com USCS Victory Lane on Saturday night. A $500 BONUS has been posted to any driver who can win both Friday and Saturday night’s United Sprint Car Series main events. The USA National Midget series co-headlines the two-night weekend of racing action at the challenging semi-banked 3/8-mile clay tri-oval with two full nights of action for the National midget racing stars. Midwest racing legend and Sprint Car Hall of Famer, Danny Smith from Chillicothe, Ohio won the USCS Winter Heat presented by Fireade Round #1 at Hendry County Motorsports Park in Clewiston, Florida on Friday, January 25th. Round #2 at the same track was rained out on the following night. 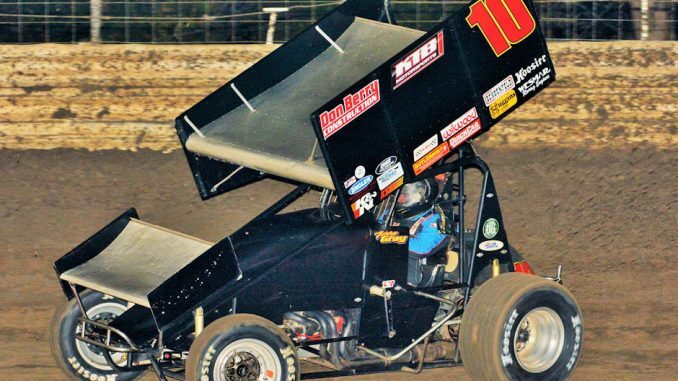 The Bubba Raceway Park event is expected to draw many of the top winged 360 sprint car drivers from across North America from at least ten states and Canada seeking warmer climates for the earliest possible winged 360 sprint car racing of the 2018 season. The USCS Outlaw Thunder Tour Winter Heat events offer over a month of racing opportunities for 360 cubic inch winged sprint car teams in the South including three more weekends for the ten-race USCS Winter Heat Series. The Bubba Raceway Park events will also be race #2 and #3 on the 60+ event 23rd season National points schedule for the USCS series. The United Sprint Car Series will invade Southern Raceway in Milton, Florida on February 22nd and 23rd during Southern Raceway’s annual Winter Nationals The following weekend the mini-series competes at two tracks in Mississippi on Friday, March 1st at Hattiesburg Speedway in Hattiesburg, MS and on Saturday, March 2nd at Magnolia Motor Speedway in Columbus, MS. The ten-race mini-series wraps up with its first ever event in the State of Louisiana on Friday and Saturday, March 8th and 9th with the USCS Bayou Sprint Car Nationals at Chatham Speedway in Chatham, LA. Bubba Raceway Park is located at 9050 N.W. Gainesville Rd. in Ocala, Florida 34482 The track telephone: is 352.622.9400. For event info please visit www.bubbaracewaypark.com or the speedway’s Facebook page at Bubba Raceway Park. The USCS series Official website is located at www.uscsracing.com The USCS phone number is 770-865-6097.